The spider has a powerful poison and occasionally bites a person, thus causing skin lesions (local injuries) and sometimes more common symptoms. These symptoms depend on the inoculation (amount) of the poison and the sensitivity of each individual. Initially, the bite is painless to such an extent that the victim is completely unaware of it, but soon it begins to become evident after a few hours with a variety of symptoms. 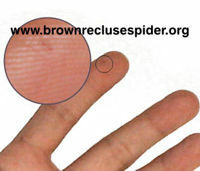 Some people, generally adults, are bitten by a BRS without consequent pain or inflammation; this goes inadvertent for some, although most victims have immediate signs of being poisoned. The poison causes the necrosis (death) of the soft tissue that starts as a local inflammation with reddening, edemas and pain. General symptoms are: fever, shivering, nausea, vomits, itching, restlessness and state of shock. The injury is usually of 1 to 2 3/4 inches and it becomes evident with the appearance of an ulcer, which can take several months to heal and generally leaves unattractive scars. One of the main characteristics of a typical bite is a hard and sharp sensation on the skin, followed by intense pain and swelling. However, this may not occur in the very beginning, when the injury is local, but within the first hours it will be possible to notice how the skin gradually turns red. After the first day, this injury changes into purple and that is exactly when the typical injury known as “livedoid plaque” appears. There are two types of poison cycles of this corner spider: one called skin Loxoscelim and skin visceral. The most common of these is the skin Loxoscelism ( 85 %), in which the aforementioned injury evolves gradually into a necrotica plaque with general symptoms. Although the patient’s life is not in jeopardy, he/she will certainly get a scar on the bitten area. The Physiopathology is a consequence of the poison action in the small vessels of the skin. The second clinic cycle is the skin- visceral Loxoscelism. Here the patient presents general symptoms all over his body: high temperature and, most importantly, blood in his urine, in macro or microscopic way. In these cases, the patient could quickly achieve deep kidney insufficiency which turns later into multiorganic insufficiency. This pathology can cause the death of the patient (laxoscelism mortality rate 1 to 3 %). These phenomena are mainly caused by the toxin action in the red corpuscles and the kidneys. The most common question is: What causes a skin cycle or a skin-visceral cycle in a person? Unfortunately, this question has not been answered yet. It depends on the susceptibility of each person towards a certain stimulus, something that remains in the genetics of everybody’s immune system. What it is certain is that cycles are more serious in children. According to the treatment, there are many alternatives. In general, asking the patient about the episode is the most important measure since it will allow the doctor to use the right medical treatment to prevent further damage. Besides, we can find a widely used antidote in drug stores; however it has not shown 100% effectiveness and that is why its use is still controversial; the patient has a lapse of 6 hours after the bite occurs. It is important to regard this antidote as an alternative way of healing; it is not going to affect the patient in a vital sense. It is available in the market and it is worth trying, but we must remember that it is not a good example of an advisable treatment. For more information browse the links found on the context menu.